I haven’t forgotten that I promised a Part 2 to my post “Browsing the Cinevent Library”. Unfortunately, I’ve been dealing with some computer issues lately that have put more than a little crimp in my never-lightning-swift pace, including losing my image-editing software of choice — which, careless as I often am in such things, I can’t remember the name of and hence can’t find again to reinstall. I’m working to resolve all this as fast as I can (real life does have a way of interfering, doesn’t it? ), and will get back to the subject at hand as soon as possible. Meanwhile, here are a few afterthoughts about another of the pictures screened at Cinevent this year: Cry of the Werewolf (1944), a Columbia B-picture that took the screen in Columbus, appropriately enough, at midnight on Saturday, Day 2. This was the first directorial effort of Henry Levin, who would go on to a career not without its pleasant touches here and there: Mr. Scoutmaster, Journey to the Center of the Earth (’59), The Wonderful World of the Brothers Grimm, Where the Boys Are. 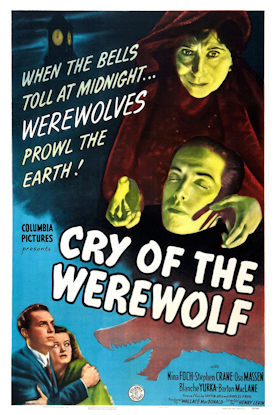 Unfortunately, Cry of the Werewolf isn’t one of them. But it’s not a total washout either. In the title role, believe it or not, is 19-year-old Nina Foch as a gypsy princess struggling with an ancestral lycanthropic curse. It’s Nina Foch all right, but it wasn’t easy to recognize her; in this she’s softer, less hard-edged and (no pun intended) cougar-tough than she would appear later in movies like An American in Paris (can you believe she’s only 27 in that one? ), Executive Suite and Spartacus. Beyond that rather interesting surprise, though, Werewolf is a pretty flaccid affair. It’s clear that the boys in Columbia’s B unit — producer Wallace MacDonald, writers Griffin Jay and Charles O’Neal, et al. — took a look at what Val Lewton was doing over at RKO with pictures like Cat People and I Walked with a Zombie and thought, “Hey, we can do that!” Well, no. That sort of atmospheric chiller, it turns out, is not as easy as Lewton and Jacques Tourneur and Mark Robson and Robert Wise made it look. It’s not as simple as sending a German shepherd sauntering through a darkened set and telling the audience it’s a wolf. Still, at 63 minutes, Cry of the Werewolf wasn’t long enough to waste my time; on the contrary, it demonstrated by negative example just how efficient and effective Val Lewton’s movies really were. Since “this utterly suspenseless film” (NY Times, 8/12/44) will probably never come out on video, it’s thanks to festivals like Cinevent that we’re able to make that kind of compare-and-contrast. Ack! Sorry to hear about your computer troubles. That can be soo frustrating. You've made some interesting points about "Cry of the Werewolf". I've not seen this but I was glad to read your thoughts. Thanks for commiserating, Silver. The basic problem is the loss of Microsoft Picture Manager, which I guess was far too simple and intuitive to remain. In keeping with the long Microsoft tradition of always making things more cumbersome and less user-friendly, it's been supplanted by something called Photo Gallery — supplanted, but not replaced. I found another program almost as efficient as MPM, and that's the one I lost and can't remember the name of. If need be, I can always fire up the old computer and use Picture Manager there, but I'm hoping to avoid that. There's a reason I replaced that old computer. Thanks so much for your recent visit to my blog and for the great discussion about Robert Ryan in general and "The Iceman Cometh" in particular. I'm sure your friends enjoyed their dinner and a movie very much. I definitely need to see that movie! I am reading your comment back to SS, and you mentioned the loss of Picture Manager. I had no idea that was gone…it's what I use, and it works fine. I use an old form of both Word and Outlook. I bought the Microsoft Office upgrade, but I'm not in the mood to try and learn something new, so I remain with the old products. Hi, Patti, and thanks for dropping by! Yes, annoying as it sounds, Microsoft has discontinued Picture Manager with the Office 2013 package. The good news is that I finally remembered — or to put it more honestly, stumbled upon — the image-editing software that I lost with my recent trouble. It's called PhotoPad, and it's a free download available here from NCH Software. You might want to check it out. It takes a little getting used to, but it's a whole lot more user-friendly than Microsoft's new Photo Gallery, and it does everything Picture Manager could do, plus a lot more. Jim, thanks for the info about Photo Pad. For now, I'm keeping with the now-defunct Photo Manager. Until I break down and install the new Microsft Office package on my computer, I've still got that.